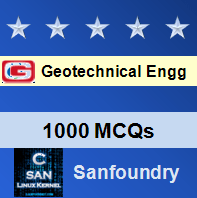 This set of Geotechnical Engineering Multiple Choice Questions & Answers (MCQs) focuses on “Well Point System”. Explanation: Drainage or dewatering is the process of removing the water from the water table for the purpose of excavation for construction purpose. 2. Which one of the following method can be used to lower water table, using gravity flow? Explanation: Well point system can be used to lower the water table. The process is based on gravity flow. Explanation: A well point is a perforated pipe about 0.5 to 1 m long and 5 to 8 cm in diameter covered by cylindrical wire-gauge screen. 4. The ground water table may be lowered by which of the following methods? Explanation: The ground water table can be lowered by methods like ditches and dumps, well point system, shallow well system, deep well system, vacuum method, electro-osmosis method. 5. What is the minimum depth of water that can be brought to the surface in well point system? Explanation: The suction pump used in the well point system has a capacity of bringing water to the surface from a minimum depth of about 6m. 6. For dewatering more than 6m below the water table, which of the following method is used? Explanation: Multi stage well point system at precise distances is used for dewatering more than 6m below the natural water table. Explanation: A advantage of using jetting is that the water under pressure washes away soil fines from around the well point leaving a relatively coarser material to settle to form a natural filter around the well point. 8. In well point system, ___________should be made essential for proper working of the system. Explanation: In the well point system, a round the clock pumping schedule is essential, as the interruption in pumping can have catastrophic consequences. Explanation: For suction of water one auxiliary pump for each two well point in the use should always be available.